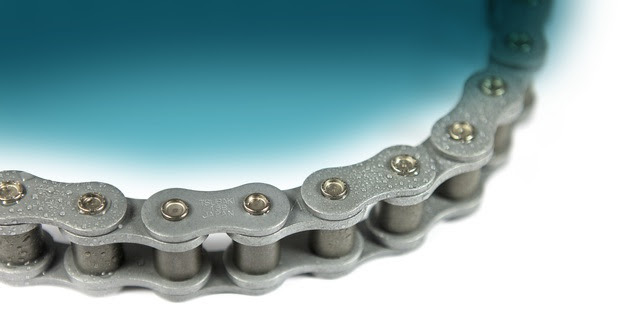 Tsubaki proudly presents the worldwide release of surface treated anti corrosion Neptune™ chain series, our solution for applications exposed to water, seawater, chemicals, and high humidity conditions. Neptune™ Chain has superior corrosion and chemical resistant performance, developed for Tsubaki's centennial anniversary. The first release in Tsubaki's 100th Anniversary model G8 (Generation 8) series. Tsubaki's Neptune™ Series comes with the full strength of its carbon steel ANSI and BS standard chain series, which now have a longer service life in corrosive environments than ever before. With the unique multi-layer surface, Neptune Chain has superior corrosion and chemical resistance compared to the previous series, N.E.P. Chain. Our special base layer coating is a zinc type followed by a highly chemical resistant top coating and a special resin coating. The roller is also sealed with a special coating to give it superior rust prevention and preserve its durability when engaging with a sprocket. Neptune Chain's anti-rust performance is superior to previous models. N.E.P. Chain was coated with a traditional plain zinc, and as a result, there were many cases of premature corrosion when used around chemicals. 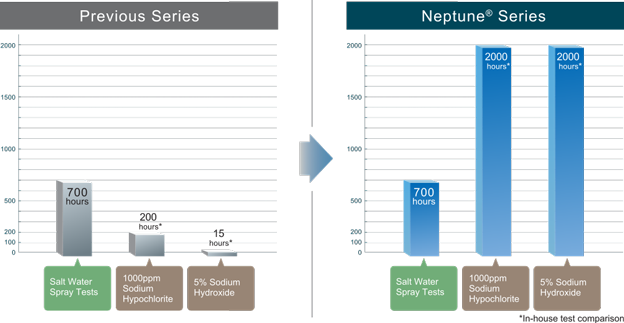 The chemical resistance of the Neptune Series increases this resistance almost 15 times compared to N.E.P. Chain. The better performance of Neptune Chain is one of Tsubaki's commitments to increasing the customer's economic benefit. Keeping all of the main features of N.E.P. Chain, Neptune Chain has also become one of Tsubaki's environmentally friendly products that passed the RoHS (Restriction of Hazardous Substance) compliance, which is one of the most stringent international regulations restricting hazardous chemicals from industrial products. This is part of Tsubaki's efforts to bring more ecological benefits to the environment. The Neptune™ brochure is available for download here.